The Realtors and customers at The Trembley Group love to live and play in Myrtle Beach and along the Grand Strand. We love everything about the area. There is always a wide variety of activities in the to take advantage of. In February, if you’re looking for an international/cross-cultural experience, The Trembley Group Real Estate suggests a celebration of Chinese New Year. 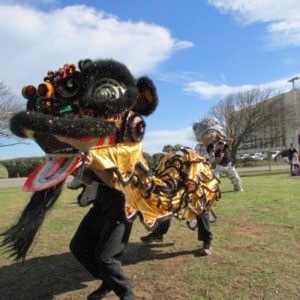 On Saturday, February 4, from 11 a.m. until 3 p.m., visitors to the Franklin G. Burroughs-Simeon B. Chapin Art Museum can honor The Year of the Rooster with a Free Family Day celebration of Chinese New Year. The Chinese zodiac is divided into 12 blocks (or houses) just like its western counterpart, but with the major difference being that each house has a time-length of one year instead of one month. In Chinese astrology, those born in the Year of the Rooster are deep thinkers, capable and talented – often outspoken. Roosters are always brave. As always, this year’s celebration will kick off with a traditional Dragon Parade and Lion Dance, followed by storytelling, Chinese dance and a wide range of games, lectures, demonstrations and family art workshops, a fun and family affordable thing to do in Myrtle Beach. Other activities will include a talk on acupuncture, vegetable carving and musical performances with singing group and on hulusi (Chinese gourde flute), erhu (Chinese fiddle) and guzheng (Chinese zither). There will also be an ice sculpture demonstration with Eric Wagner (HGTC culinary professor) and martial arts demonstrations including Chi Gong and Tai Chi. Children will make Chinese toile plates, a rooster hand print mural, lanterns and rooster masks as well as kites (weather permitting). They can play Chinese-originated games such as dominoes or Chinese checkers; watch traditional Chinese paper cutting or have their names written in Chinese calligraphy. Youngsters can enjoy storytelling and face painting, explore Chinese children’s literature or watch a video of Sesame Street’s Big Bird in China. There will be two other films, geared towards adults, for viewing throughout the day. The first, titled Guonian, depicts New Year’s traditions as they are observed in China. The second, titled The Films of Deben Bhattacharya: Chinese Opera, features the music and dance, religion and social customs related to the everyday life of people in several countries of Asia and Eastern Europe. 2:15 p.m. Acupuncture talk with Jennifer M. Kiser, L.Ac. While enjoying the Chinese New Year festivities, take a few minutes to enjoy the visiting exhibits currently on display at the Franklin G. Burroughs-Simeon B. Chapin Art Museum. Since their first appearance at the Museum of Fine Arts, Houston in 2002, the quilts of Gee’s Bend have been the subject of national critical acclaim and popularity, not least demonstrated by their appearance on the US postage stamp in 2006. Made by multiple generations of African-American women from the isolated, rural community of Gee’s Bend (now Boykin), Alabama, these quilts have been compared to the likes of high modernist paintings, as well as improvisational jazz. With their innovative compositions of bold patterns, colors, and textures, these masterful quilts continue to occupy the imagination of the American public. The Franklin G. Burroughs-Simeon B. Chapin Art Museum has a selection of these national treasures on display with Gee’s Bend: From Quilts to Prints. The Franklin G. Burroughs-Simeon B. Chapin Art Museum is just one of the many things Myrtle Beach and the Grand Strand has to offer. We are convinced that you will so love the area that you’ll want to come back. Compared to many places, Myrtle Beach real estate is still a bargain. So, you may decide to retire here and make your vacation permanent. Or, maybe the time is right to invest in a vacation home. If you would like to see what options are available, give us a call. We are passionate about helping you make well-informed decisions during one of life’s most exciting times. Whether you’re looking to change your lifestyle by selling your house, purchase your dream home or both, our team of Real Estate advisors will guide you.